If the quality of a weekend is judged by the number of bug bites one receives, then this past weekend was legendary. From Thursday afternoon to Monday evening, it was a 47-bite period, which is roughly equivalent to 5 stars. You've heard about our amazing steam engine outing, which although not first chronologically, was first in importance, so I had to share it yesterday. But our weekend was jam-packed with additional craziness in the form of a fun camping trip on Thursday night and a party with friends on the fourth. Wait, what's that?!? Did I use the words "camping" and "fun" in the same sentence? Perhaps I should explain lest my reputation as a sarcastic complainer become tarnished. The biggest lesson we learned from camping excursion #2 is that there is no such thing as "beginner's luck" in camping. During that first outing, everything that could go wrong did go wrong. Now, it is possible and probable that we had some role in that. Not me specifically, of course, since I had SUCH a positive outlook on the entire affair, but all of us as a whole. This time around we chose a much newer campground, and for any married couples in the room, allow me to give you the following advice: clean bathrooms = happy wife. The spacious shower house had two isolated family showers, so we were all able to pile in and hose off our two dirty, sticky and sweaty beasts. Why so sweaty, you ask? Well that is because although we were much wiser in our planning, we left much to be desired with our common sense skills. Did you check the weather report? No, did YOU? As we sat along side our aluminum trailer (that, incidentally, can fry an egg faster than a cast iron pan) we wondered how we managed, once again, to choose the hottest day of the summer to forgo the luxuries of home. We made it through and breathed a sigh of relief as the sun went down, and with it went the oppressive heat. After we'd soaped them up, rinsed them off and engaged in the standard "naked chase", it was my turn for a shower. Flying so high from surpassed expectations, I happily shared my shower with an overzealous lightening bug, who did not seem to like the water but had an attraction toward my body wash. I like papaya too, so I couldn't really blame him. It seems to me that the allure around camping isn't so much the act of staying away from one's house, but it is the act of engaging in regular activities minus any sort of technological advancements. Want to make some eggs? Start a fire! Want to play a game? Make up your own! Need to pee? Drop your pants! I always had Cael pegged as the one that would beg to go home within 10 minutes, but surprisingly he found activities to keep his attention. Within 45 minutes or so, he lined up all 8 million pieces of pea gravel into one long parade to make a train. Shocker. Graham helped him by meticulously picking gravel from the grass and either aiding Cael in his efforts or by covertly filling all of the cupholders with gravel so that we would spill our cold drinks when we attempted to use them. When Cael wasn't preparing for his future locomotive career, he was busy practicing his batting stance. 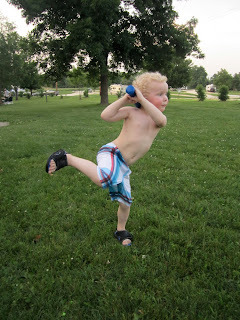 He comes from a long line of baseball players, as you may remember, and clearly has a genetic disposition for baseball. Just look at that form-- major league hitters should really take note. Cael swears that lifting his leg makes the ball laugh. And what is baseball if not entertaining? So for once in my overly-dramatic and bizarre life, things flowed pretty smoothly. Little did Cael know he would need that calm and rest to prepare him for his surprise train ride on Saturday. And what a surprise it was. It caused such a ruckus, in fact, that I had a knot in my stomach fearing he'd be a holy terror when he realized that such treats are rare and a privilege, not his right simply for being so darn cute. He succeeded in rationing his glee just enough to last until Monday night and the promise of sparklers to replenish his "anticipatometer". 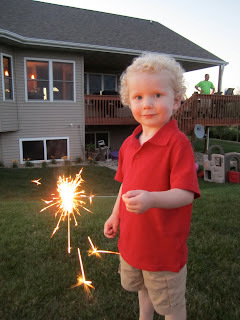 We'd prepped Cael in advance about the sparklers. Not knowing exactly how he'd respond, we considered past precedent and decided a house fire wasn't out of the question. 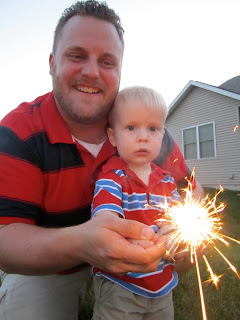 After a test sparkler was successfully "sparkled", we determined that he was capable of holding one on his own at the party (with supervision of course). Once at our friends' house, the kids put on their swim gear and my kids stripped down to their underwear because I was too preoccupied with my dessert to remember their trunks. 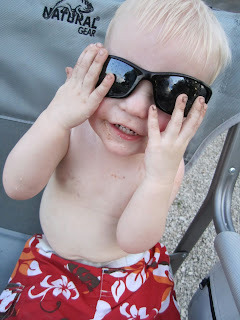 It's okay, though, because Graham seems to get cuter the less clothing he has on. It's an issue I'm hoping will resolve itself before his teenage years. Once the kids were dried off and I'd surgically removed Cael's underpants from his rear end where they'd taken up permanent residence, it was time to eat. Everything was delicious and perfect summer fare. After demolishing the most flavorful watermelon I'd ever had, it was time for dessert, and dessert (for those of you that don't know) is my specialty. I've had a side business for a few years that kept me busy with homemade chocolate truffles and other candies. It's not something I have had much opportunity to do in the last year, but whenever there is a party, my gracious friends know that I claim dessert-- forever. My name is Mary Foreman and I am a dessert snob. There. I said it. And it's true. But the good news is that I love to do it, and I love to share. 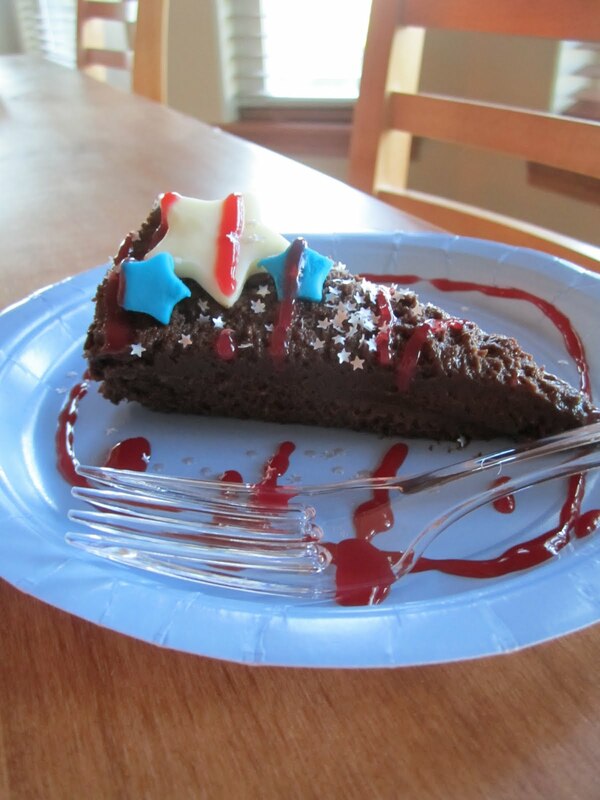 So when I knew there was an opportunity for a 4th of July dessert, my gears started turning. A blueberry tart? Cappuccino Cheesecake? Fresh Berry Trifle? This time I decided to make the most decadent, richest thing I could think of: a flourless chocolate cake. I know that doesn't sound very fancy, and in truth it didn't look very fancy either. When the directions said to remove from the springform pan only 30 minutes prior to eating, I had a premonition that the whole shoot-and-match might just fall apart, but I forged ahead anyway because I had the vision. It wasn't so bad, in actuality. The texture was somewhere between french silk pie and cheesecake, but I did accurately predict that it wouldn't slice up like a traditional cake. Luckily I was prepared with some glitzy decorations I'd crafted the night before in the form of fondant-like stars in white and blue, and a homemade Raspberry Amaretto Puree. My husband had to bite his tongue when he learned that the pièce de résistance was a tiny vial of edible glitter stars for a whopping $6.99/bottle. Ouch. We snobs have a real problem. After we rolled ourselves away from the table, it was time to put the aforementioned sparkler demo to the test. Could he handle it? I was confident it would be fine, but we all huddled around to shout warnings at him gently help him to use the sparkler safely. Once lit, he held the sparkler as far away from his body as possible with two fingers; a move reminiscent of my own behavior while preparing to dispose of one of Graham's stinky little packages. As soon as the flame went out, however, he grabbed the hot end with his right hand in one swift move. My mind immediately flashed through statistics I'd read over the years. "148% of child deaths are a result of fireworks-related incidents." Could that be right? Would I be sitting in courtroom a year from now, defending myself alongside the other neglectful mothers of the world? Snapping back to reality, I was relieved to see that nothing really happened at all. He said the stick was very hot, but there were no tears and no marks at all. Relief. But wait-- how is it possible that this little mutant can feel no pain from a red hot poker, yet can wail and scream every time I clip his toenails? There really is no justice in the world. As we awaited the fireworks display, we learned that they had moved the location from which they start the charges. This meant that we saw little more than a flash above the trees and nothing more than some loud bangs during the finale. We weren't concerned, since Graham had already crashed for the night and Cael was busy chasing a poor toad around the yard that he'd likely marked for death. Our town's summer festival starts tomorrow with a kick-off fireworks display anyway, and it takes a lot more than a lack of explosives to ruin an evening with good friends. 47 bug bites might do it, though. I'll keep you posted.